AMD just launched the AMD EPYC 7000 series processors. Formerly known as AMD Naples, it boasts up to 32 AMD Zen processor cores, and challenges the Intel Xeon’s dominance in the datacenter. After a sneak peek at their Computex 2017 press conference, AMD finally revealed the EPYC 7000 series processors. Let’s take a look! Like Ryzen, the EPYC processor is based on their new Zen microarchitecture. 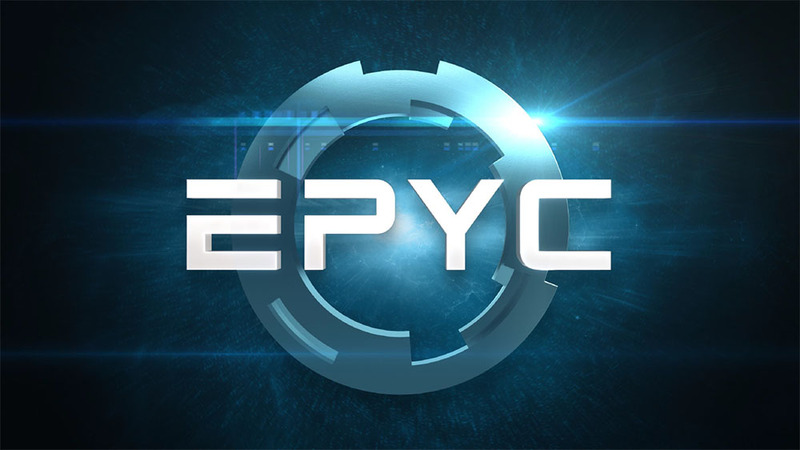 Designed for servers, the EPYC processor offers up to 32 processor cores, an integrated high-speed DDR4 memory controller and a new high-speed coherent interconnect. AMD now reveals that it also comes with an embedded security subsystem. Supports up to 32 AMD Zen cores., each capable of handling 2 simultaneous threads. Integrated DDR4 memory controller with 8 memory channels, each supporting two DIMMs. That’s a total of 16 DIMMs per processor socket, allowing for up to 2 TB of memory. A 2-socket server will support up to 32 DIMMs, with a total memory capacity of 4 TB. The EPYC processor is fully integrated with high-speed I/O including 128 PCIe 3.0 lanes. Because the EPYC is a complete SoC, there is no need for a separate chipset, reducing cost and power consumption. In a 2-socket system, two EPYC processors communicate with each other via the AMD Infinity Fabric coherent interconnect. Even though each EPYC processor has 128 PCIe 3.0 lanes, it is limited to 64 PCIe 3.0 lanes in a 2-socket design. The 2P EPYC system will have a total of 128 PCI 3.0 lanes, not 256. In addition, AMD revealed the first EPYC family of processors – the EPYC 7000 Series, with nine processors divided into four segments. They also introduced three EPYC processor variants designed for single socket servers. EPYC 7601, 7551, 7551P and 7501 processors have 32 cores and a peak TDP of 170-180 W.
EPYC 7451, 7401 and 7401P processors have 24 cores and a peak TDP of 170-180 W.
EPYC 7351, 7351P, 7301 and 7281 processors have 16 cores and a peak TDP of 170 W.
EPYC 7251 processor has 8 cores and a peak TDP of 120 W.
If you have the time, check out this 103-minute presentation on the EPYC 7000 Series processors by Dr. Lisa Su and Forrest Norrod from AMD, as well as their partners. Dr. Lisa also comes out at the end to reveal the AMD Radeon Instinct MI25 accelerator, that we revealed several months earlier. Previous : The 2017 ASUS ZenBook & VivoBook Laptops Revealed! Next : The nubia M2, M2 Lite & N1 Lite Smartphones Revealed!